When it’s my month to host the Bellas (we’re three image consulting buddies), we have lunch and then we walk across the square to the store J.James to visit our style inspirer, Valerie, who works there on Sundays. We check out the divine clothes, scarves, handbags, necklaces, bracelets, rings, and gifts. I don’t buy many things there, but the few things I’ve purchased I’ve used a lot. I recall the Sunday when I spotted on the rack against the back wall a sheer, sage colored long duster with a shawl collar. My heart skipped a beat. Would it fit? It did. It was perfect. I might as well have been Cinderella slipping into the golden slipper that she’d left behind at the ball when the clock was striking midnight. I don’t remember if Cinderella was speechless at that moment, but I was. I knew I had found THE ONE. Am I being overly dramatic? Quite possibly, but maybe not. When I saw my reflection in the full-length mirror I felt more “me” in the duster than I did when I took it off. The Bellas loved it on me and Valerie thought it was divine. “How will you wear it?” Valerie said. “No idea,” I replied. And I meant it. I had no idea. I didn’t know how, where, or when I’d wear it. When I purchase something, I’m usually wearing it in an outfit the next day. If not, I give it three days or maybe five days, and if I haven’t had the urge to wear it by then, I take it back to the store for a refund. I didn’t wear the sage duster in twenty-four hours. I didn’t wear it in five days. I didn’t wear it in a month or three months or six months. I didn’t wear it for nine months. I saw it every day I opened my closet but never work it into an outfit. Did I have doubts about that purchase? Maybe teeny tiny ones. But I kept thinking one day it will be splendid. I was willing to wait for that day regardless of how long it took. In basic terms, I wondered if it would look good over a column of white or a column of black. Maybe it would be best over palazzo pants (didn’t own them) or a jumpsuit (didn’t have one). I thought about it some more. It seemed elegant but organic, inspired by Nature, mysterious, something that would be worn by a princess running through a forest, trees on both sides of her, the forest floor rich in black soil mixed with decaying leaves. With the duster floating behind her and her long wavy ash blond hair bouncing up and down, she was happy and free. Last week I got inspired and the dream turned into an outfit. It started with a new pant I’d purchased five days ago. It was a classic for me; a slim knit; a pant for all seasons to wear with longer tops. 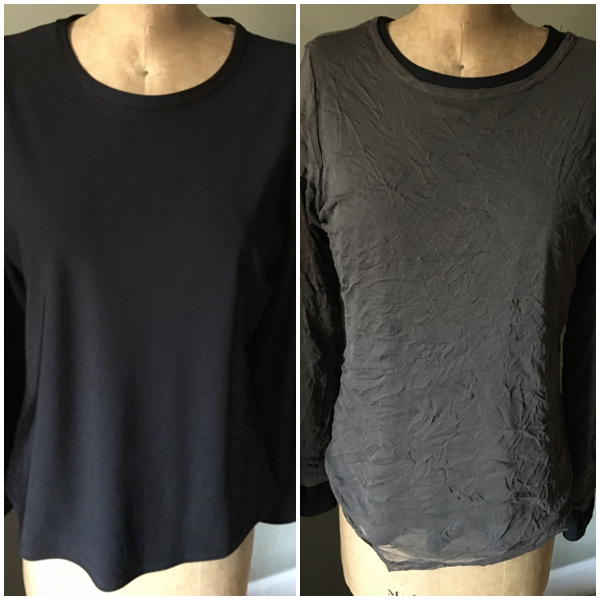 I decided to add a simple black Babette long-sleeved T-shirt. There was my basic canvas: a column of black. Okay, now what? I looked into my closet and saw two things almost at the same time. One was a gray-green crinkled Babette stretchy sheer T-shirt that my daughter Erin had picked up at a consignment store. She bought it for herself but it was too big on her so she offered it to me. Behind it was the sage duster. 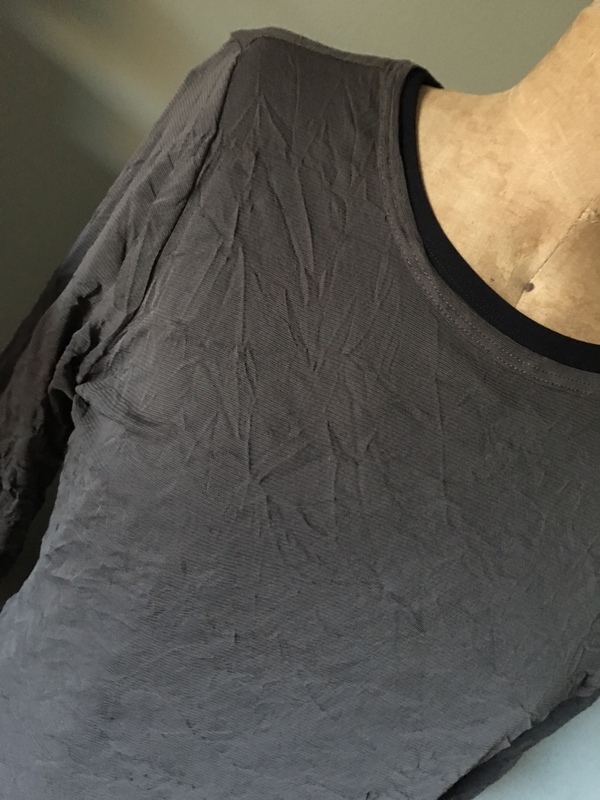 I layered the gray-green crinkle sheer T-shirt over the black polyester T-shirt. I loved the textures in the outfit: smooth and crinkled. The color palette represented the wonder and mystery of Nature. The black was the rich soil and the gray-green and sage were the trees in that quiet forest. I felt peaceful, glorious, and grand as I looked into the full-length mirror in my bedroom. Next I had to choose my accessories. I didn’t want to disturb this forest mediation I’d created. I had to be careful. Figuring out the right accessories took longer. I tried several things before landing on the right combo. 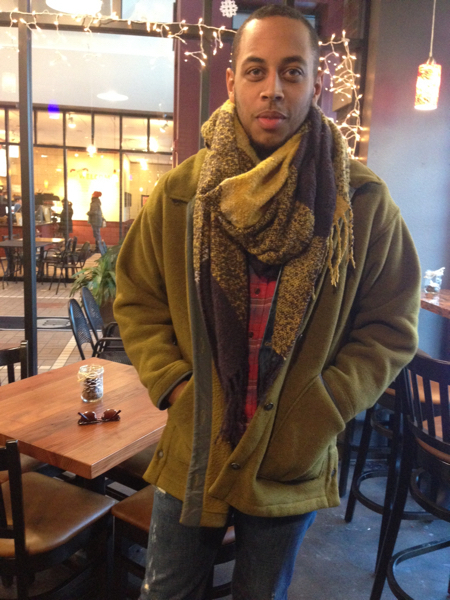 I’ll tell you all about that part in Part Two of this Anatomy of an Outfit. Stay tuned! My mother recited poems to us when we were growing up. One of them was Trees by Joyce Kilmer. I don’t know why it always made us laugh, but it did. Maybe it was the glee in her sing song voice when she recited it. 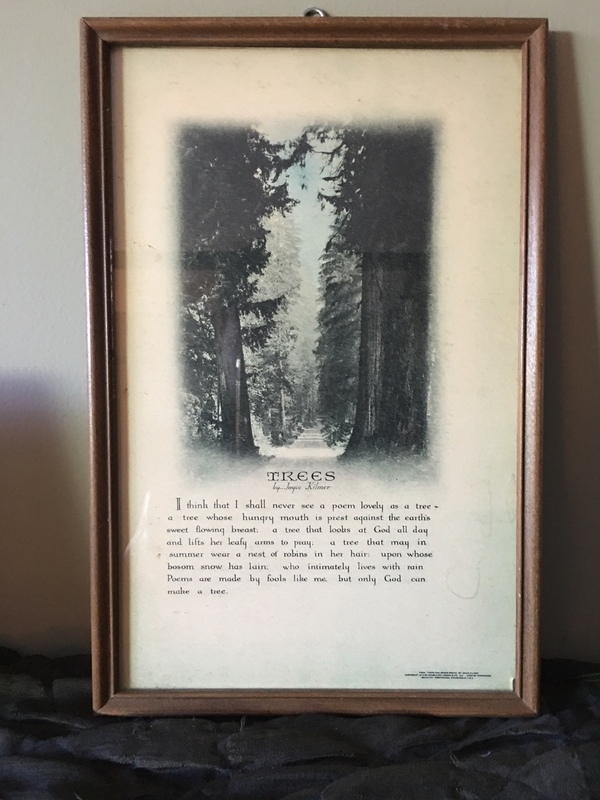 Years and years later, I found this framed image with the poem Trees by Joyce Kilmer. I gave it to Mother and it hung on a wall in their lake home. Last August when I was there, I saw it again and brought it back home to lean against the sage walls of the bedroom I share with my Prince Charming. Mother, this outfit is for you. This is a beautiful outfit. The duster is unique and it drapes well. I want one! My instinct would have been to add a colorful scarf, but that would have ruined the lines of the duster and the effect of the entire look. Thank you for sharing how this evolved. Can’t wait for Part 2 tomorrow! P.S. : I really enjoy reading your blog (with my morning coffe). I’ve learned a lot from your style tips. I am overjoyed at being part of your morning coffee routine! Thanks for the privilege! Yes, it was harder than I thought to stay true to the “sound” of this outfit. But you’ll see all the steps I took! I believe finding THE ONE is why we (women) do the shopping we do. I am always trying to find an article of clothing that sparks joy . . . and it is rare. Love your story! Robin, I think what you describe here is what we should be doing–waiting for items that will spark joy. I often see people getting into shopping ruts where they “settle for” things that don’t bring joy. It takes more time but it’s worth it! Thanks for sharing your comment! The outfit is beautiful and you look beautiful in it! I am glad you waited until you found the perfect way to wear it. I often do that as well…..
How funny about the Trees poem – I have heard the first line of it, but never the whole poem before. Rebecca, happy to hear you do this too–wait for the right moment. What you said about the poem–I still am wondering if Mother had her own verses because it was always entertaining. But when I read it through again, it was all familiar just the way it was! I so wish I had her voice on tape and could hear her recite other poems. She and my Uncle Chet could entertain each other for hours as they both loved reciting poems. It’s fun to remember her this way! It’s good to have rules about our clothing, but like this example, it’s also good to be flexible about those rules!! I try to wear everything new right away, but life gets in the way at times, and there are some pieces that need to “marinate”! You look fabulous in this outfit Brenda, and I’m glad you kept the duster! Thanks, Jodie! I’m so glad I kept it too! Like you say, some things need to marinate. I’m glad I gave it time. Thanks always for your delightful comments! Ah…your process is lovely and deep. I love that you have such sweet and bittersweet story around this earthy ensemble. Much like the subject of reverence for Nature and the desire to merge in some way–your tribute inspires me to look to seasons, landscapes and sparkling moments of Memory. Brenda, thank you for showing the entire oeuvre and for sharing vulnerability that quietly speaks…volumes. I love hearing your responses to what you read here. When it came down to adding the image of the poem Mother recited so very often growing up, I wrote that the wall it was leaning on was sage. I hadn’t thought about that! Sage is on the walls of the bedroom and it is my safe cocoon. That probably adds to why I feel the way I do in this outfit. You’re so good for me! I love how you make me think. Thanks, Katherine! 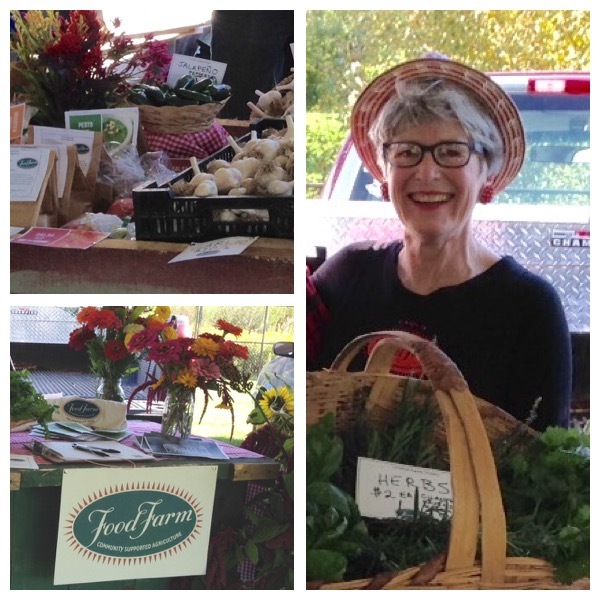 You’re always great, Brenda, but today you totally rocked it! That is a truly beautiful look. Thank you Laurice! I’m glad you like it like I do! Love this story – your outfit is stunning! I also love the Babette t-shirt and would like to know where they are sold. Thank you. The crinkle Babette was found at a consignment store. The other Babette, the black one underneath the crinkle one, was one I purchased last month at Shunzi in Petaluma. I just heard a rumor this week from a client that Babette was considering shutting its doors. It’s been around for 40 years or so and they were just ready to be done. I tried googling it but didn’t find anything that said that so hopefully, it is a rumor. Doris, most perfect question. The answer is YES!!! I did consider it, in fact it was my first consideration. In the most current post I explain how I put the jewelry pieces together. Check out the blog and I’ll walk you through the decision. Good call, Doris, I must say!!! Thanks so much, Tress! I’m so glad! I think this duster is meant to also be in my closet. Your combination of pieces is perfect. You pulled it off for sure and is now one of my favorite outfits. Your Mom would be proud. Maybe we could share it, Elizabeth!!! And yes, Mother would be proud. Ah, thanks for saying that. I’m having a moment! 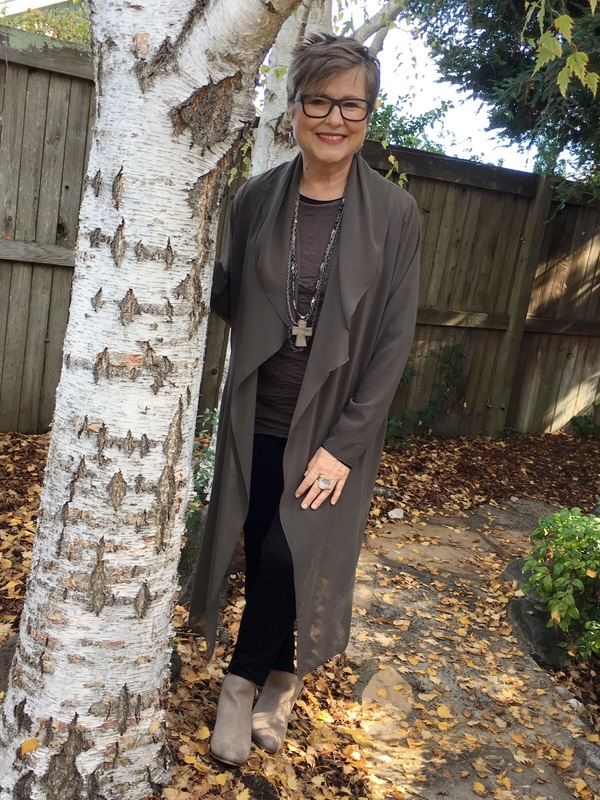 My Mom had me memorize that poem as a child.I still know it by heart.You are wearing my favorite colirs.Love that duster. Lovely! You had a smart mom!